Have you ever wondered what it’d be like if Batman and the President of the United States from Independence Day sang a song together? Or, have you ever wondered what it’d be like if the cast of High School Musical found themselves in the late 19th century with nothing more than a pack of newspapers, some cigarettes, and hearts of gold? Or, have you ever wondered how news traveled before the Internet? 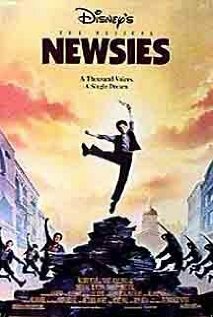 Newsies, a film starring Bill Pullman and a young Christian Bale (among others) and directed by the guy who brought you all three High School Musical films, will tickle your inspiration and dazzle your dance shoes. When the cost of selling newspapers goes up, a ragtag group of newsboys go on strike. And, in a display of true patriotism, they voice their social concerns in the form of song and dance. But their jazz hands quickly turn to brass knuckles when the authorities and Joseph Pulitzer come after them. In some fight scenes reminiscent of Charlie Chaplin movies, the newsies struggle for their independence (day). Though there are a number of storylines running throughout the movie (a love plot, a bromance plot, a New Mexico plot, and a teen rebellion plot), and though any of those storylines could have led the audience to the victorious finale, I choose to believe that the newsies were led to victory by only two things: dancing and Gov. Theodore Roosevelt. In fact, had Gov. Roosevelt showed up earlier, the newsboys wouldn’t have had to practice parkour all around New York, and Crutchy wouldn’t have had a run-in with the fuzz. But, Roosevelt didn’t. And the newsies did. It all worked out in the end though. The guy gets the girl, the newsies get a better price for the papers, and the citizens of New York finally get to know what the heck is going on in the world.